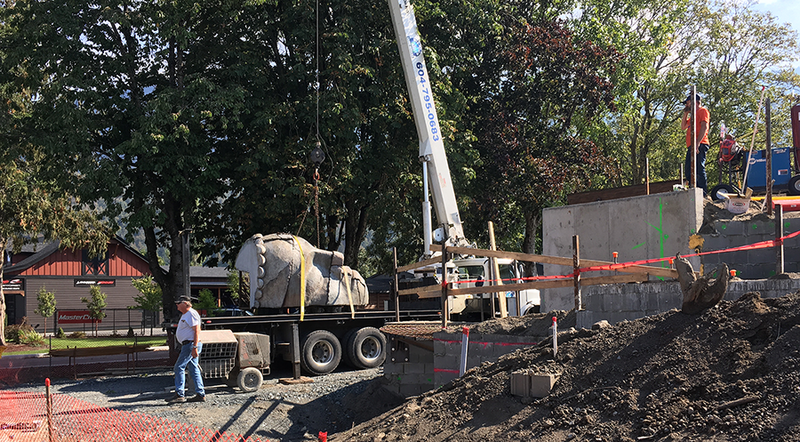 It’s not every day that we get to roll a gigantic stone elephant head down the main street of Yarrow but today was that day. It was the day to lift three more pieces of the Hazelnut Inn into place. The giant sleeping head was moved to the next door property on the back of the crane truck. The tower roof fit on the sidewalk as the crew wheeled it next door. The elephant head was a slow moving parade pushed by the forklift. :) Thanks to John, from Wishlow Crane Service, a very smooth operator, all three pieces were lifted and placed perfectly. It won’t be long until the next batch of even bigger pieces are ready to go!